Formula 1 title rivals Lewis Hamilton and Nico Rosberg could remain Mercedes team-mates for the next three seasons, ex-world champion Alain Prost says. 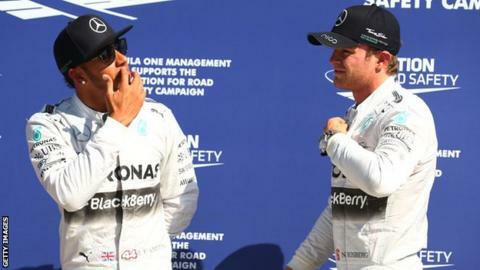 The pair have clashed throughout the season, with Rosberg colliding with Hamilton at the Belgian Grand Prix. McLaren boss Ron Dennis predicted that the tensions could cause one driver to leave the team. "I don't think it can last for five or six years but it would be no problem for two or three," Prost said. Former Red Bull driver Mark Webber also questioned whether Hamilton and Rosberg can remain team-mates at Mercedes. But Frenchman Prost, who famously had a bitter rivalry with Brazilian Ayrton Senna when the pair were team-mates in the 1980s, believes the Silver Arrows "can keep things together for a long time". He told BBC Radio 5 live: "It is the work of the team. You can never show one driver he could have a technological or psychological advantage. "If you can keep this situation going you can keep things together for a long time." Prost believes the incident in Belgium, for which Rosberg later issued a public apology, was blown out of proportion. "It was a small incident, a small mistake from Nico," he said. "There's no way he could have done it on purpose, but it's inevitable that everybody inside and outside the team, they overreact." Rosberg gifted Hamilton victory at Sunday's Italian Grand Prix after running wide at Monza's first chicane, and Prost believes a cautious approach could cause the drivers to make more errors. "I am sure they are going to be so careful that maybe they can do even more mistakes," the four-time world champion said. "We have two exceptional drivers fighting for the championship - I hope they can be free until the end of the year."